When it comes to the food outlet options in shopping malls, it is often a case of quantity rather than quality. So, it came as a nice surprise that Lao Beijing in Plaza Singapura offered a comforting and satisfying dinner experience. 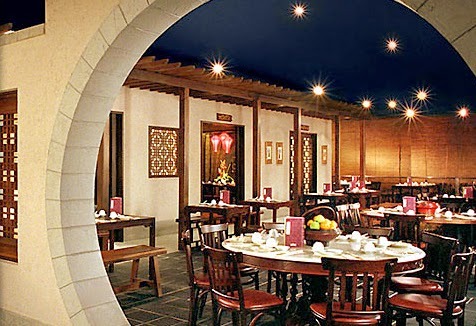 Lao Beijing prides itself on serving authentic Northern Chinese cuisine in a family-friendly and cosy setting. There were certainly many families with young children eating here on a Friday evening and the noise levels were quite high. However, the seating is spacious and the decor is reminiscent of an old Chinese tea house. We ordered the mixed seafood "hor fun" noodles, the Beijing-style fried "mee hoon" noodles, the steamed pork, prawn and chive "jiao zi" (dumplings), the steamed pork buns and the pan fried onion pancake (pictured below). Apart from the hor fun, which was a little too soggy for me, the other dishes were well-executed, nicely seasoned and just plain delicious. The menu at Lao Beijing is fairly extensive, so we will definitely be back to visit this local eatery for our next fix of Northern Chinese food!